When properly introduced, Harris's Hawks generally work well with dogs and ferrets, accepting their furry partners as extended members of the hunting party. Introduce dogs and ferrets as early as possible, preferably as soon as you start training your hawk. When you first take the hawk and dog hunting together, make sure that the hunting spot has ample game. 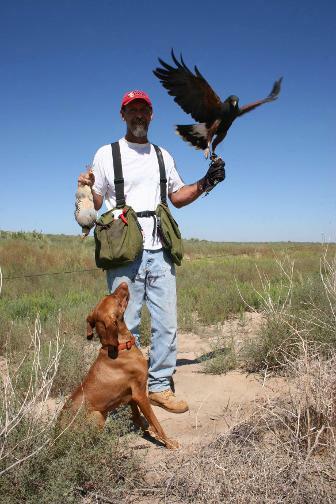 It is generally easier to train male Harris's Hawks to not attack dogs, especially small breeds of dog. Female Harris's Hawks can be trained to accept dogs, but socialization tends to be more challenging and may take more time. A number of falconers have made the mistake of reducing the young Harris's Hawk's weigh drastically, and then taking it hunting with a dog. This is definitely not the recipe for success! Our book, The Harris's Hawk Revolution, has a chapter on hunting with dogs and another about hunting with ferrets.